In recent years, we've seen movies based on real people and events from history dominate the awards season. (I did not like Birdman, but I was glad to see something other than a biopic win this past year.) Why is this? I don't know, but it's clear that producers have noted this trend and every fall, we get a slew of "Based on a True Story" movies -- So many that at times they seem to dwarf fiction films. Are some of these movies good and compelling? Of course, they are, but they can't all be perfect, and eventually Hollywood is going to run out of life-stories to plaster on-screen. In the meantime, we are going to get a mixed bag of these movie, including an odd-ball disappointment like Big Eyes. Big Eyes begins in the late 1950s, as Margaret (Amy Adams) takes her young daughter, Jane (Delaney Raye), and leaves her husband. She moves to the San Francisco area, where she re-connects with old friend, DeeAnn (Krysten Ritter), and supports herself painting furniture. Margaret's true passion is painting pictures of children which has disproportionately large eyes. While displaying her wares in the park, she meets Walter Keane (Christoph Waltz), a fellow artist. They begin to see one another and are soon married, in a move which allows Margaret to keep Jane. Walter sees the potential in Margaret's work and attempts to sell them. When one does sell, in the heat of the moment, Walter claims to be the artist. As she loves Walter and can't scoff at the money, Margaret agrees to go along with this. A natural salesman, Walter begins to push the paintings and soon the Keanes are rich. However, no one knows that Margaret spends her days locked away working on the art. How long can this charade go on? When we watch a biopic, we must not only separate reality from poetic license, but we must try and place ourselves into the world of the film so that we can truly appreciate the story. All of those things are a challenge with Big Eyes. Now, there's no doubt that the story of the Keanes is an interesting one. Until the film begin to get hyped, I'd never heard of them, so the subject matter was intriguing. (I was somewhat surprised that I wasn't familiar with this story. 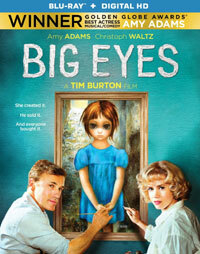 I'm of an age, where, given the popularity of the paintings portrayed in the movie, it seems that I would have encountered a big eyes picture at some point, but I've never seen one in real life. Maybe it was a West Coast thing.) When one hears the story of how Margaret allowed Walter to hog the spotlight (especially a condensed version), you want to know more. But the story as presented in the film really struggles to hold our attention. We are told in the making-of featurette found on this Disc that Margaret stayed with Walter and allowed herself to bear the brunt of the work because she loved him. However, that doesn't come across very well in the movie. They meet, they get married out of convenience, and suddenly she's working around the clock. I never felt that she had any passionate feelings for him. Thus, we spend the film saying, "Why would she stay with him?" There is also the fact that even those who aren't familiar with the real-life story can either guess how the movie ends or perhaps they heard about it through the film's publicity. Unlike other real-life dramas where there is great suspense despite the fact that we know the outcome, like Apollo 13, Big Eyes becomes very redundant, as it's scene after scene of Margaret hiding the fact that she's the painter and Walter becoming more and more famous. Save for one small twist in the third act, we simply wait for 100 minutes for the truth to be revealed. There's no doubt that Tim Burton has tried many genres in his career and I honestly think that he tried too hard to make a "normal" drama here. He infuses the movie with great colors, and there is one scene which really works because Tim Burton is behind the camera (It's the supermarket scene which was in the trailers), but the movie simply has no soul. This isn't Burton's first crack at a biopic. 1994's Ed Wood worked because the subject matter allowed Burton to be quirky and this actually evoked emotion. Big Eyes simply goes round and round, turning an interesting American scandal into a bland soap opera which has style and no substance. Isn't it ironic that Keane's paintings received the same criticism. Big Eyes studied art in Paris on Blu-ray Disc courtesy of Anchor Bay Entertainment. The film has been letterboxed at 1.85:1 and the Disc contains an AVC 1080p HD transfer which runs at an average of 31 Mbps. The image is very sharp and clear, showing no grain and no defect from the source materials. The colors look fantastic and this could easily be a demo disc The image is never overly dark or bright. The picture has a nice amount of depth and the level of detail is notable. The disc carries a DTS-HD Master Audio 5.1 track which runs at 48 kHz and an average of 4.5 Mbps. The track provides clear dialogue and sound effects. The stereo effects show good separation and occasionally highlight sounds coming from off-screen. The surround sound effects come into play with party and street scenes. The only notable subwoofer effects come from the music. The Big Eyes Blu-ray Disc contains only two extra features. We begin with "The Making of Big Eyes" (22 minutes). This featurette, which feels like a made for TV special, offers comments from Burton, the creative team, and the cast. We also hear from Margaret Keane herself. The bulk of the piece focuses on the real-life story and the challenge to bring it to the screen. Additionally, it also looks at the challenge of portraying real-life characters, which also leads into a discussion of the cast. Finally, there is a look at Burton, himself. The other extra, "Q&A Highlights" (34 minutes), offers a sit-down with Adams, Keane, and screenwriters Scott Alexander and Larry Karaszewski.